“Clean” e-liquid, what’s in it? “There’s a very common myth about e-liquid – that “you never know what’s in it”. Which for the most part is untrue. In this section we look at eliquid ingredients – a warning – and towards the end review the safest, tested eliquids available on the market today. Don’t take risks with your health! A base, usually vegetable glycerin. This usually has a mild sweet taste but will be masked by most flavours. VG e liquid causes plumes of visible vapour that aren’t actually necessary but are a great way to help simulate smoking for ex “analog” cigarette smokers. Many people feel comfortable with VG since it’s derived from plants. PG, propylene glycol. Which is also the main ingredient in the inhalers asthma sufferers use. In e-cigs, this chemical is used for the purpose of carrying flavour which it is good for because it’s thinner than the VG. It’s important that this is not confused with diethylene glycol which is commonly used in anti-freeze and should be avoided. Thirdly, there are the flavourings. Flavourings should be food grade and whether they’re synthetic, natural or organic is up to the manufacturer, but as long as they’re food grade then they should not contain anything nasty. And lastly there’s the nicotine. Believe it or not many e-cig users opt not to smoke e-liquid containing nicotine, but for those that do, there are varying strengths and pharmaceutical grade nicotine is used. The harmfulness of nicotine is still contested. Many believe that the nicotine in cigarettes is not particularly damaging to our health and that it’s more the tar or other chemicals. As far as other possible added chemicals you may find in common e-liquids, the jury is still out on certain flavourings but so far the only real known threats that may be used by producers are diacetyl and acetoin, used in custard/buttery flavours – and the actual risk to users is still up for debate though a lot of vendors are removing it from their liquids. Though if you want to stay on the safe-side then these chemicals should be easy to avoid. So the common ingredients in e-liquid should be relatively harmless, but in such a loosely regulated market how can you be confident you can trust what you’re buying without holding a doctorate in chemistry and reading multiple peer reviewed studies every time you want to try a new flavour? The best way is to stick to brands where you can be confident they care. Brands like “Platinum” by V2 and “ECOpure” by CNC, as well as guaranteeing only pharmaceutical grade ingredients both test their liquids for purity every time they make a batch. ECOvapes’ new ORGANIC 100% VG e-liquid range also comes to the table boasting the same credentials and replaces the old ECOpure range. This basically means that nothing but the intended ingredients end up in the liquid you smoke. Even if you’re tempted by some brand-less flavour you’ve seen on eBay – it’s probably worth giving a miss – the problem is that at this point anyone can make e liquid and they may care more about making a quick buck than a stranger’s health. 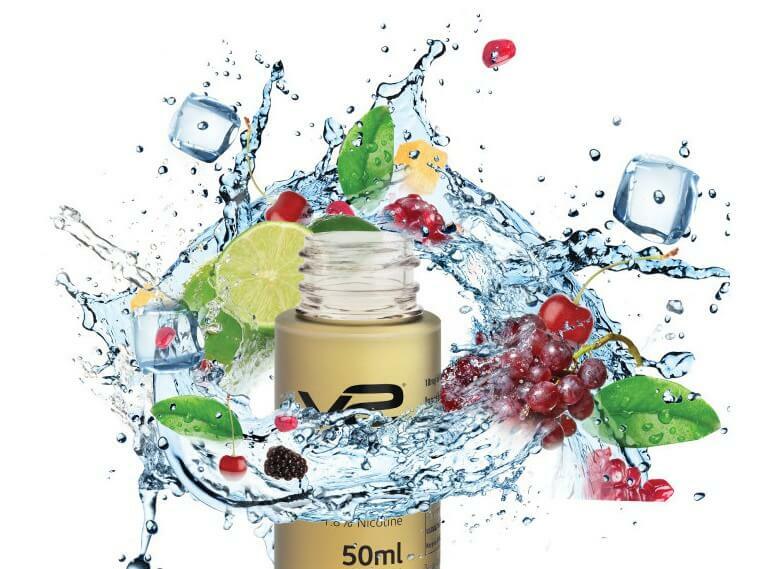 EcoPure have now brought out a new pure PG eliquid , clean Vype and Vpure e-liquid. 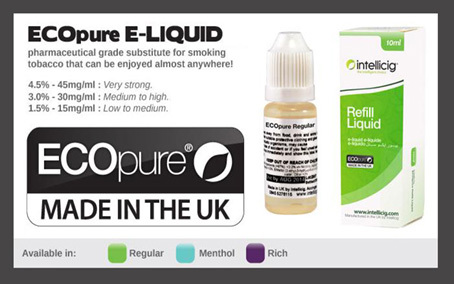 Sadly they have stopped making the ECOpure VG range which is bad news for cloud chasers or those with an intolerance to PG eliquids. However a new e-liquid, ECOvape has been brought out to replace ECOpure that not only offers similar safety certification and testing but also offers a wide range of shisha and vape flavours. The ECOvape range also has the advantage of being organic. To compliment this new range Vype – part of the same group are introducing the new Vype eTank electronic cigarette – Vype’s first modular open system e cigarette. This is vape pen is aimed at light smokers – the e-liquid only contains a maximum of 12 mg strength and for average to heavy smokers 18 mg or even 24 mg may be required. These companies take the process of eliquid manufacturing seriously. They use proper regulated laboratories no different to those used in the manufacturing of medical products. With Platinum eliquid V2 go one step further, you can even get an on-line report of the exact purity and content of the e liquid you are holding in your hand… real time – that’s how serious they are! What's in your E Liquid? Clean Organic 100% VG Liquid (Without Needing PG Mixer)!